If you’re looking for your team to experience Sydney at its best. Bushsports offers guided Bushwalking, Abseiling, Kayaking, Cycling, Mountain Biking, Blue Mountains adventure escapes and terrific outdoor group Events! Call now – we have just the adventure waiting for you! Think you’ve seen it all? Its time to look at it from a different perspective! Try an abseiling adventure, explore Sydney from the Blue Mountains to the beaches. Rappel down the sides of remarkable cliffs as you push your limits to the max. Under the guidance of our BUSHSPORTS specialist, you’ll rappel from heights as much as 30 meters. Fancy yourself an avid adventurer? Try one of our more intense Abseil Activities, embarking on a multi-pitch abseiling adventure throughout the Blue Mountains. Abseiling beside hidden waterfalls, spectacular cliffs, and into lush forest gives you the chance to experience Sydney adventures like no other. Need to bond your team? Looking for a team building activity that won’t put your team to sleep? Then Abseil safely! Rappelling is the ultimate way to build trust in a team! Abseiling fosters trust, camaraderie, and teamwork between your employees. As teammates guide and belay their partners down cliff faces, powerful bonds are formed. The chance to get out of the office and explore The Blue Mountains with each other is sure to give your corporate team the boost they’ll need! For more information about your Abseiling adventure, click here. Need a change of pace? Go for a rejuvenating Bush-Walk! Set out on one of our excellent Bushwalks throughout the Sydney area, explore The Blue Mountains, National Parks. Imagine your staff turning up for work only to start the day with a bushwalk in nearby bushland or a guided their business neighbourhood unearthing stories to share. BUSHSPORTS adventure staff, explore the outdoors and experience the parts of Sydney you never knew. All the while knowledgable BUSHSPORTS staff will teach you about the surrounding geology, and the unique fauna, as well as the rich past, and culture of the native aboriginal people. With hikes suitable for those of all levels- the beginner bushwalker or the seasoned one, we’ll have the right trek for you! Choose from day hikes to overnights, no matter the location; with over 800 parks and reserves to choose from your options are endless. Looking for a team building exercise? what better way to unite a team than to explore the great outdoors. 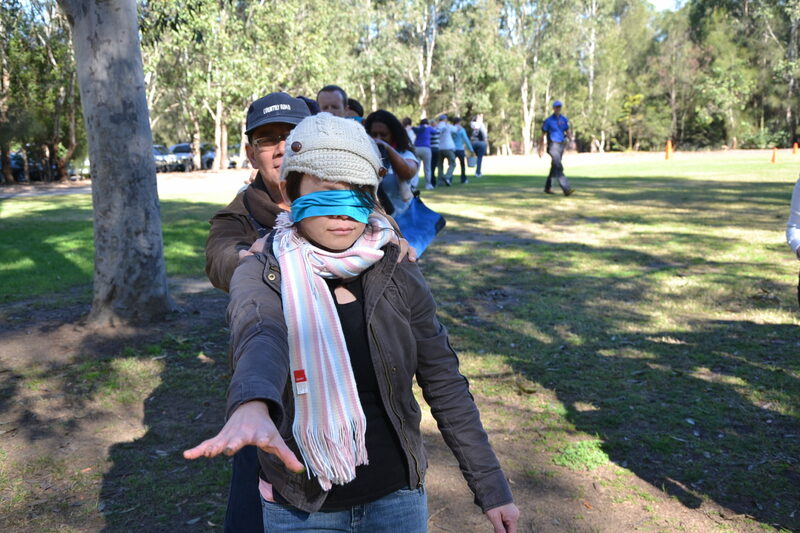 Hike through the various terrain all the while learning about your team. Bush-walking is an experience sure to strengthen team bonds, as your team discovers each others’ strengths and weaknesses, helping one another to overcome their obstacles. Enquire about your Bushwalking experience click here.